israel | XKV8R: The Official Blog of Robert R. Cargill, Ph.D.
My First Person editorial for Sept/Oct 2018 issue of Biblical Archaeology Review (BAR 44/5) is titled “The Importance of Archaeological Provenance.” I hope you can give it a read and learn about some new policies we’ve instituted at BAR regarding newly-introduced unprovenanced objects and our publication of them. The word provenance (alternatively spelled provenience) comes from the Latin provenire, meaning “to come forth, originate.” Thus, archaeological provenance refers to the verifiable information regarding the origin of an archaeological object—the dig site or location in which it was discovered, its locus, stratum, dating, etc., as well as its chain of custody, that is, who possessed the object since its discovery. Conversely, an unprovenanced object is an object whose origin and chain of custody is unknown or partially unknown. These objects may have been looted from an archaeological site, forged, or otherwise acquired, legally or illegally, by a private collector, who often keeps the objects out of the hands of scholars. Some collectors, however, do offer their collections to scholars for study, but this process often merely increases the value of the objects for the collector, who then sells the objects for a greater profit. Other collectors sell their collections but demand that their identities be kept anonymous for fear of criminal prosecution or the stigmatic consequences of dealing antiquities on the black market. Once the archaeological context of an object is lost, it is worth far less academically, as it can no longer reliably tell us anything about the people who made it. This is because the archaeological context—the place in which it was found in the ground—offers archaeologists as much information about the object as the object itself, like clues as to who was using the object, what it was used for, how old it is, etc. Scholars and the Israel Antiquities Authority have condemned the purchase of unprovenanced objects by antiquities dealers for decades because it encourages the looting of archaeological sites by providing a financial incentive to those who would attempt to sell them to unwitting tourists and treasure seekers. Because objects discovered in licensed archaeological excavations belong to the state in which they were discovered—the most important of which typically end up displayed in the various states’ archaeological museums—those who wish to collect artifacts often turn to antiquities dealers. And while some antiquities dealers are licensed by the state to sell legally obtained objects, many others engage in the sale of illicitly obtained objects and, in turn, often collaborate with shadowy middlemen to acquire their goods (i.e., the black market). Claims (typically made by licensed antiquities dealers) that the purchasers of illicit antiquities often act as “rescuers,” who ransom the looted artifacts from a life of shrouded anonymity on the black market so that they can be researched and published, are unconvincing. Continued illicit purchases only fuel further demand on the black market, which inevitably encourages looting. And even if a particular object has already been looted and is already on the black market, the sale of these antiquities, both legal and illicit, drives future looting, as stock must be resupplied. Reducing the demand by banning the non-state sanctioned sale of all antiquities and obstructing their transport is the only true way to begin to curtail looting. Furthermore, the damage done to potential and excavated archaeological sites by unscrupulous thieves far outweighs any benefits gained by the research and publication of these now decontextualized objects, which have been stripped of the valuable contextual data derived from a verifiable provenance. One might object, “But what about the Dead Sea Scrolls? They began as unprovenanced objects before they were systematically excavated!” This is true, as did many objects that are now prominently displayed in the world’s greatest museums. These objects, as well as the additional problem of the transport of cultural history objects out of their homelands, contributed to the establishment of the 1970 UNESCO Convention on the Means of Prohibiting and Preventing the Illicit Import, Export, and Transfer of Ownership of Cultural Property. Simply put, since it went into force in 1972, nations of the world agreed not to trade in illicit cultural heritage objects. The Dead Sea Scrolls were discovered beginning in 1947, prior to the 1970 UNESCO Convention, but you can understand why news of the recent acquisition of scrolls by the Museum of the Bible from contractually anonymous black-market dealers caused so much furor among scholars. 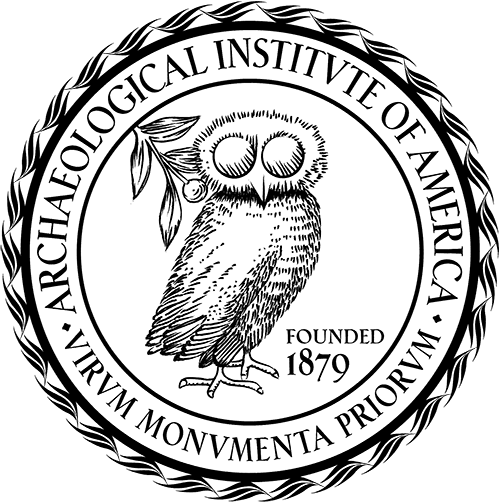 The Archaeological Institute of America (AIA), the American Schools of Oriental Research (ASOR), the Society of Biblical Literature (SBL), and the Association of Art Museum Directors (AAMD) have all established policies on unprovenanced antiquities that prohibit participation in the trade of undocumented antiquities and the activities that give sanction to that trade, including exhibiting unprovenanced objects in museums, publishing articles on them in their respective journals, and presenting professional papers on them at annual conferences.2 This is all done in an effort to discourage the looting of archaeological objects. By scholars refusing to participate in research, the unprovenanced objects lack the professional credibility required to authenticate the objects—authentication that enhances their monetary value. Thus, in theory, by scholars refusing to authenticate the illicit objects, their value is diminished, which results in lessened demand, leading to less looting. It is for this reason that last November at the SBL annual meeting in Boston, I announced that BAR would no longer publish newly discovered or introduced unprovenanced archaeological objects in its pages. BAR occupies a unique place between the academy and the public. While it is our primary mission to convey the latest archaeological discoveries and research to the public, we also have a responsibility to discourage looting and the forging of archaeological objects by not promoting them in our magazine. If and when the next sensational unprovenanced archaeological object is introduced to the media, BAR may use its position as a media outlet to explain to our readers what the claims being made are and why the unprovenanced nature of the discovery makes the discovery problematic. But as a practice, BAR will no longer publish newly introduced unprovenanced objects in an effort to play our small part in guarding against looting and forgery.—B.C. 1 A portion of this column was adapted from an earlier blog post (robertcargill.com/2017/07/19/the-museum-of-the-bible- why-are-archaeologists-and-bible-scholars-so-mad/). 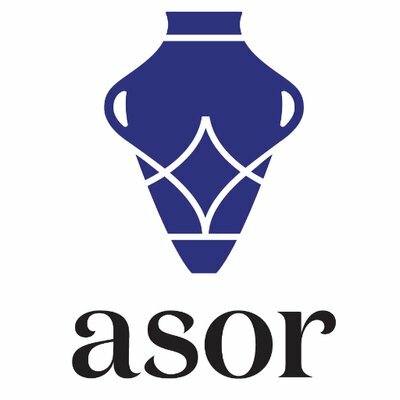 2 ASOR and SBL provide an exemption for cuneiform tablets (see, e.g., www.asor.org/ initiatives-projects/asor-affiliated-archaeological-projects-2/standards-policies/policy-on- cuneiform-texts-from-iraq/). Sarah E. Bond has a nice article in Forbes this week about Donald Trump’s decision to skip Masada during his visit to Israel and the West Bank. In it, my colleague discusses the reasons President Trump should have gone to visit the famed hilltop fortress. While it once served as an opulent southern hideaway for the tyrannical Herod the Great, well-removed from the established Judean capital of Jerusalem, Masada is best remembered for its role in the Great Jewish Revolt against Rome (66-73 CE), and concepts of honor, loyalty, and the Jewish history of perseverance in the face of oppression. But the president didn’t go. Mr. Trump cancelled his visit to Masada after he was informed that he wouldn’t be allowed to land his helicopter on the over two-millennia-old archaeological ruins atop the mountain. Thus, while there are many reasons the president should have visited Masada, there are also plenty of reasons the president should not have cancelled his visit–political reasons, symbolic reasons, and reasons that give us a glimpse into the mindset of our 45th president. 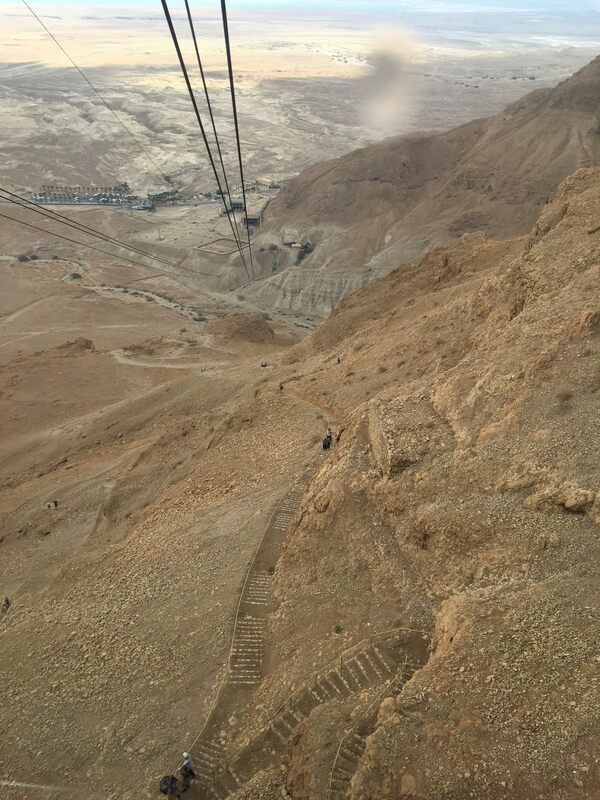 Masada’s Snake Path can be seen below the cables of the Masada cable car, both of which lead to the Visitor Center at the foot of the mountain. The first reason is simple: it’s Masada. From the Visitor Center, you either walk the Snake Path or take the cable car to the top. For two millennia, Christian and Jewish pilgrims, tourists, and soldiers have made the arduous journey up the mountain to visit this monument to perseverance. Tourists do it. Soldiers do it. Staff members do it. President Trump should do it like everyone else, including Presidents Bill Clinton and George W. Bush. However, when President Trump was told he couldn’t land his helicopter on the famed archaeological remains in order to avoid the heat and sweat of the journey, he cancelled the visit. The fact that Donald Trump cancelled says a lot about how he views himself as opposed to literally everyone else on earth, including other U.S. Presidents. Second, if riding the cable car is too much work for President Trump, then he wouldn’t be able to see the site anyway. The top of the plateau is massive–over 1.6 million sq. ft., or 36.78 acres! Furthermore, many of the key components of Masada lie on the perimeter of the top of the mountain–with some even carved into the side of the mountain–and these are accessible only by lengthy, rather precarious staircases. Any tourist who has visited Masada knows this. Only those in relatively good shape and possessing strong legs and great balance are able to descend into Herod’s hanging palace. You simply cannot experience Herod’s resplendent extravagance if you’re not willing and able to put in the effort. Even via the cable car, visiting the mountaintop Masada fortress requires some sweat and getting dirty–two things the president loathes and typically lets others do for him. 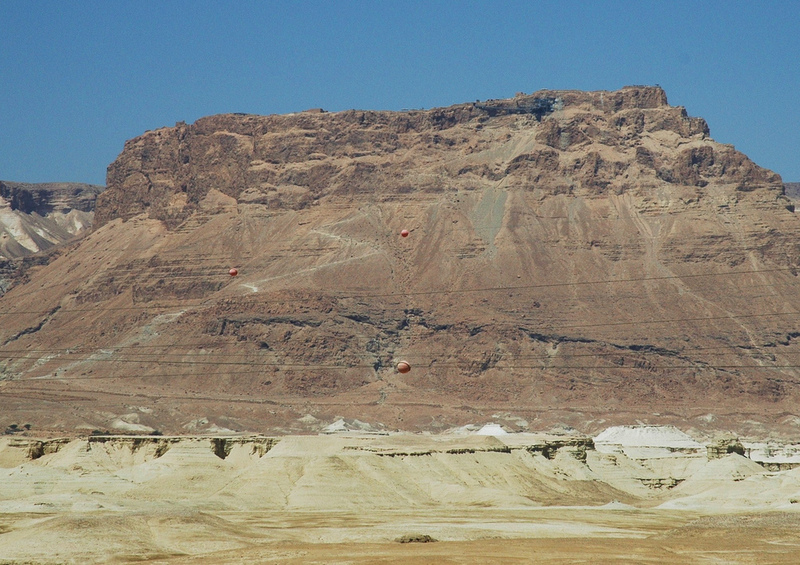 The mountain of Masada from the east/Dead Sea. Photo by: gaspa, Creative Commons. President Trump wanted credit for reaching the top of the mountain, but needed more help getting there than others who are required to work for their achievements. And when he couldn’t take the easy route, he quit. Finally, it is quite telling that when the president was told he could not ascend Masada–a monument to resistance–via helicopter, he backed down. This tells us something. When faced with strong resistance, Donald Trump backs down, because taking on the resistance requires discipline, patience, and persistent focus and effort–all clubs the president has repeatedly demonstrated he does not carry in his bag. President Trump did a great many other things on his trip to Israel. But sometimes it’s the things you don’t do that say the most about you. And our president has shown us repeatedly that while everyone else must work hard for what they achieve, he will take a shortcut whenever he can. And when he is told he must work like everyone else, he quits. 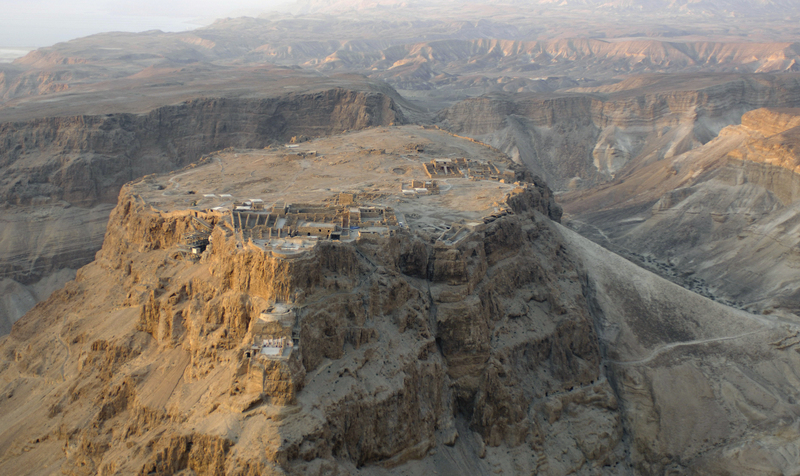 The top of Masada, looking south. Photo by: Godot13. Masada is about perseverance, honor, resistance, and hard work. It’s about being willing to die for what you believe in. And in the end, perhaps it is best that President Trump didn’t visit Masada. This mountain has already experienced one paranoid, conspiracy-laden hegemon, who achieved his position with the help of a foreign power and by agreeing to use his government to pursue their interests. Perhaps it’s best we remember Masada for those who have made the effort and the sacrifice, and not for those who fled when they didn’t get their way. 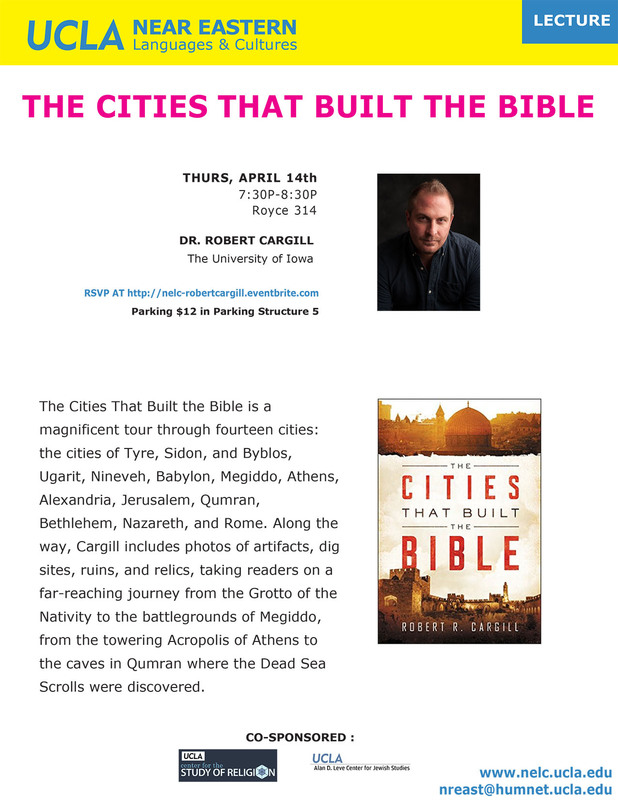 I’ll be lecturing at UCLA on Thursday evening, April 14, 2016 on my new book, THE CITIES THAT BUILT THE BIBLE (HarperOne). 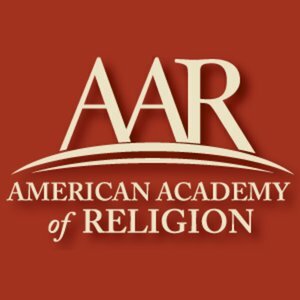 The lecture is sponsored by the UCLA Center for the Study of Religion, and co-sponsored by the UCLA Alan D. Leve Center for Jewish Studies and UCLA Dept. of Near Eastern Languages & Cultures. DESCRIPTION: The Cities That Built the Bible is a magnificent tour through fourteen cities: the cities of Tyre, Sidon, and Byblos, Ugarit, Nineveh, Babylon, Megiddo, Athens, Alexandria, Jerusalem, Qumran, Bethlehem, Nazareth, and Rome. Along the way, Cargill includes photos of artifacts, dig sites, ruins, and relics, taking readers on a far-reaching journey from the Grotto of the Nativity to the battlegrounds of Megiddo, from the towering Acropolis of Athens to the caves near Qumran where the Dead Sea Scrolls were discovered. In my new book, THE CITIES THAT BUILT THE BIBLE, I not only tell the story of how we got the Bible we have today by telling the story of key cities that contributed to its formation, but I also offer many personal stories, discoveries, and reflections on my travels to these important cities. Here is my reflection on the Palestinian people following a rather eventful dinner in Bethlehem. If you’d like to read more, pick up a copy of THE CITIES THAT BUILT THE BIBLE wherever books are sold. 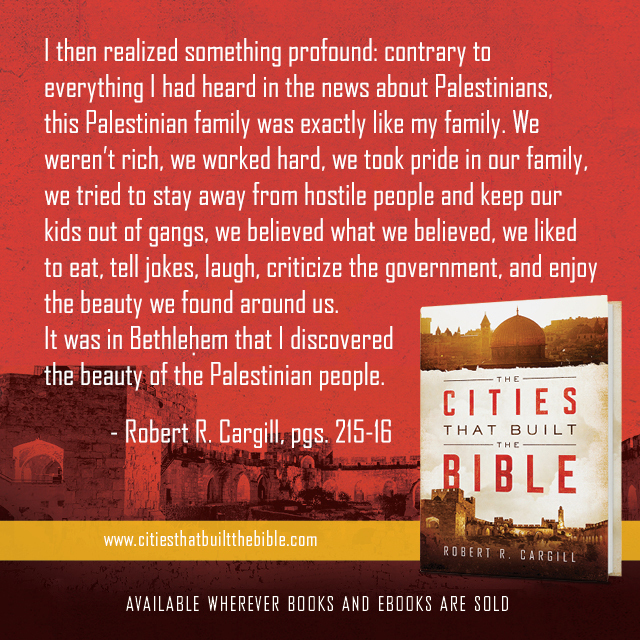 THE CITIES THAT BUILT THE BIBLE is on sale today! Today is the day. 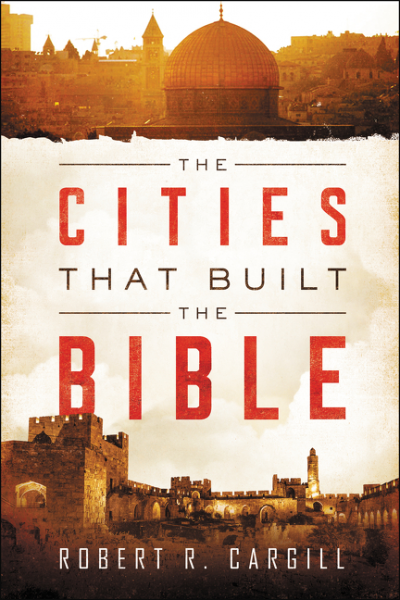 The long-awaited arrival of THE CITIES THAT BUILT THE BIBLE has come and the book is on sale today in fine bookstores everywhere. For those of you who preordered the book, your copy should arrive today. A free preview is available to read online here. You are welcome to tweet pictures of you with your copy of THE CITIES THAT BUILT THE BIBLE to @xkv8r and I’ll retweet them. You can also download the free Google Earth virtual tours of the cities discussed in the book as well as other ancient cites pertaining to the Bible at the book’s digital page. 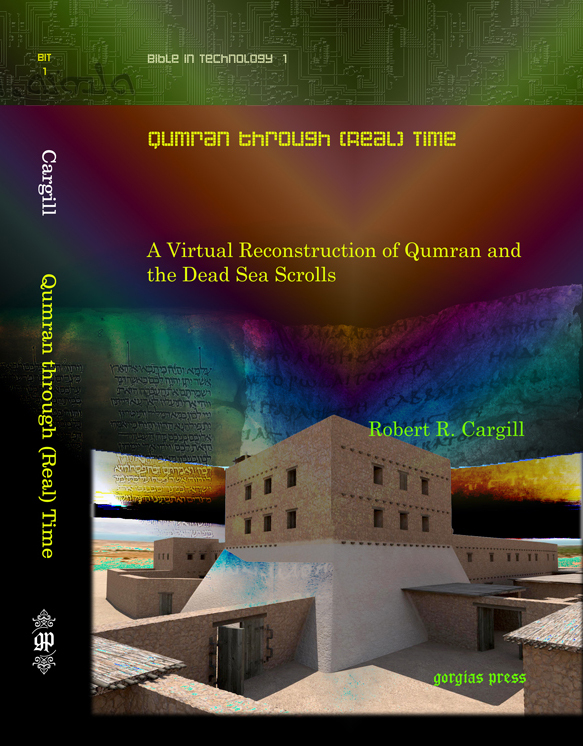 The virtual tours are absolutely free, whether you buy the book or not. I’ll be lecturing about the book, reading selections from it, and signing copies around the country over the next few months. My schedule of events is available at bobcargill.com. Again, thank you for buying the book. In it, I tell the story of how we got the Bible we have today by telling the stories of the cities that contributed directly and indirectly to its composition and canonization. And the stories of these cities are woven into stories of my sometimes humorous and sometimes highly emotional adventures in the Holy Land. You can read what people are saying about CITIES at the book’s website. You can find more select quotes from the book like those below at the media site or at the CITIES Pinterest site. So pick up your copy of THE CITIES THAT BUILT THE BIBLE at a bookstore near you. And thank you again!